Vusumuzi Saul Mkhize, was a political activist, who opposed the forced removal of the people of Driefontein during the apartheid regime. Vusumuzi Saul Mkhize was born on the 6th of June 1935 and died on the 2nd of April 1983. He worked as an accountant in Johannesburg and would visit Driefontein on a regular basis according to information supplied by the Mpumalanga Culture, Sport and Recreation Department. Mkhize, together with others, formed the Board of the Village in order to oppose the removals of legitimate landowners of Driefontein. He served as the chairperson of what later became the Council Board of Directors in Driefontein. Saul Mkhize was apparently shot dead by the police while he was organising a peaceful meeting. 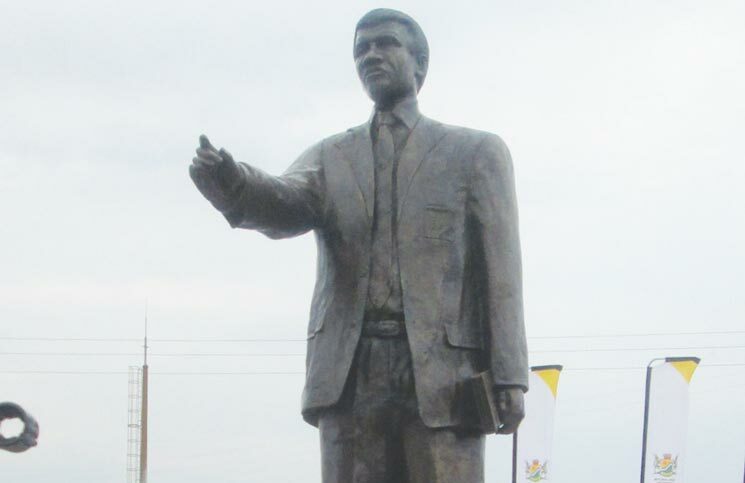 On Friday and Saturday the 6th and 7th of March, Saul was honoured posthumously by the province with the unveiling of his statue and an official renaming of Driefontein to Saul Mkhizeville. The two-day event began with a memorial lecture on Friday, March the 6th at the Mkhondo Civic Centre, which commenced at 18:00. It then went on to Saturday, where respects were paid to the late Saul at the Mkhize family gravesite. From the family gravesite, the family and dignitary members of the community convoyed to “eKhona” where the new name of the village was unveiled to the community of what is now known as Saul Mkhizeville. The highlight of the day however, was the unveiling of the Saul Mkhize Statue that was erected so that his name could live on and become a beacon of course for all those who were to be removed and “dumped”. The community came out in masses to commemorate this fallen hero. Among them were learners of Malibongwe Primary School, accompanied by their teachers. Mr Gama from the Sports, Culture and Recreation Department, recited Saul Mkhize’s clan praises and went on to highlight and elaborate on what the name Vusumuzi means and what it stands for within the community. Long live the Spirit of Saul Mkhize, Long live.